SMEs in both the manufacturing and service industries. The survey results indicate that there is a significant difference between the ownership structure of firms and the decision of SMEs to opt for voluntary audit. Moreover, the lack of resources is significantly related to opting for a voluntary audit. Therefore, based on the resource-based theory, SMEs in Malaysia mainly opt for auditing, not to fulfil a mandatory obligation but to compensate for their lack of tangible (professional/qualified accountants) and/or intangible (accounting and business expertise) resources. 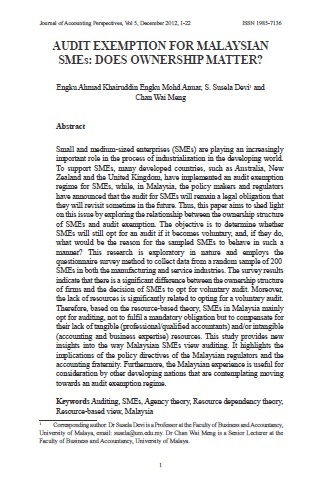 This study provides new insights into the way Malaysian SMEs view auditing. It highlights the implications of the policy directives of the Malaysian regulators and the accounting fraternity. Furthermore, the Malaysian experience is useful for consideration by other developing nations that are contemplating moving towards an audit exemption regime. ENGKU MOHD ANUAR, Engku Ahmad Khairuddin; DEVI, Susela; MENG, Chan Wai. Audit Exemption for Malaysian SMEs: Does Ownership Matter?. Asian Journal of Accounting Perspectives, [S.l. ], v. 5, n. 1, p. 1-22, dec. 2012. ISSN 0128-0384. Available at: <https://ajap.um.edu.my/article/view/3670>. Date accessed: 23 apr. 2019.